Tomorrow is somehow already the first day of December, so holiday parties should be starting very soon! Isn't it the worst feeling when you have to go last minute shopping and you find absolutely nothing that you like? I try to avoid this situation by having a few dresses in my closet that I would be happy to pull out for any event. This is my favorite dress I have bought this fall, and it is almost completely sold out. If you wear size XS, purchase it now before it's gone! You can click here to see where I talked more about it in another post. I can't get enough of all the pretty details! I got this dress in leopard print 2 years ago and was immediately obsessed. I wore it to work at k.k. FOX, dinners, Parker's work Christmas party, the Auburn-Arkansas game, etc. The style, material, pockets, cowl neck, quality, and so many things make it a dress I will have in my closet forever and wear year after year. My mom and sister also bought it after they saw mine, and I got a second one. I highly suggest this dress! My exact prints are no longer available, but this one and this one are the closest two I could find. I also LOVE the solid colors. They are a little more expensive than the printed ones, but I love the dress in this beautiful ice blue color. This is another dress that is unfortunately almost sold out, but it is PERFECT for any holiday event. If you wear size x-small or small, purchase now! The color makes it perfect for Christmas, and the subtle metallic flecks make it even more festive! If you do not live in the south, you may be confused about why I included this short sleeve dress on this list. Last Christmas, I packed all my sweaters and sweater dresses to wear in Mobile and Dothan over Christmas. Poor choice. It was in the high 70s, maybe even 80s, and sweaters were out of the question. This dress comes in 5 colors, and I think the black or deep teal would be perfect for a warm and casual holiday event. Plus, it's under $40! I have this dress in black and leopard print. It also comes in a cabernet color that would be perfect for any holiday event. This dress is so comfortable and flattering. The best part is that it is originally $34.99 and gets marked down lower than that all the time! Here is another short sleeve option that would be the perfect short sleeve dress for an event that is casual or dressy. It is under $50 and comes in 8 colors. The red or green would be super festive, and I think the black one would be the perfect little black dress you'd be happy to have in your closet. I love winter white, but the bright red color this dress comes in would be perfect for the holidays! One of my best friends wore the bright red dress with black leggings to the Iron Bowl, and it looked adorable! The exact print that I have in this dress is nearly sold out. However, I have linked a print that is more festive! This dress would be a great option for a casual holiday event. This is one of my favorite dresses of all time! Throw on some black tights and black closed toe heels, and this dress would be a holiday party stunner! I am ending this post with another one of my favorite dresses of all time! I wore this dress to my bridesmaids' luncheon, and I also own it in green. 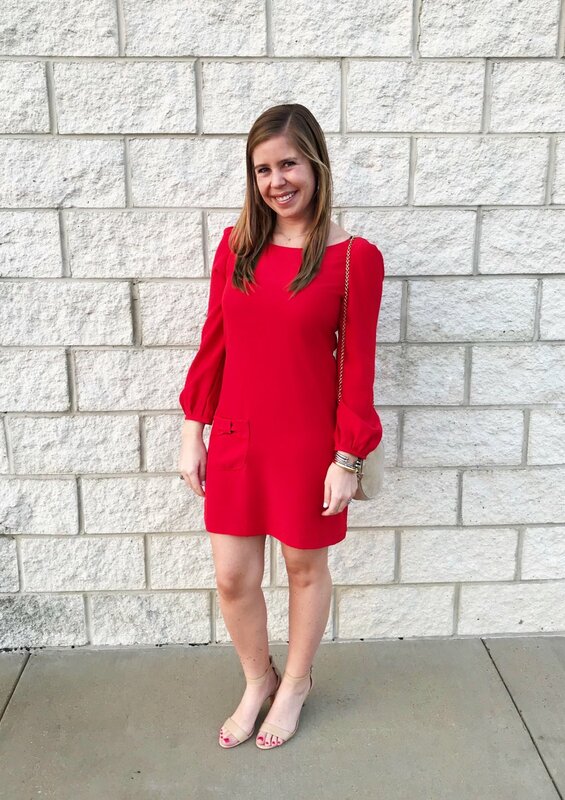 It comes in gorgeous colors, and if you're looking for a nicer holiday dress, the bright red would be perfect for any Christmas party! Click here to check it out. Do you have any favorites? I tried to include a mix of casual and more dressy dresses, so that you would be covered for all events! Thanks so much for reading! Have a great day! One last thing- honorable mention goes to this dress that I got at Personal Couture in Huntsville several years ago. It is made by Annie Griffin, who is no longer designing clothes. :( However, I searched other long sleeve red dresses and came across SO many adorable ones, so I will link them below!